Both bravery and belligerence increase an individual's chance of getting killed. This article proposes that this combination of traits may co-evolve: groups with belligerent cowards may start wars but not win them; groups with peaceful brave men will not start wars and, therefore, will not expand territorially; groups with belligerent and brave men will both start wars and win them, increasing the resources; thereby, its surviving men and women of their group will multiply. This reminds me of a recent paper on parochial altruism. In that paper the authors argued for the co-evolution of parochialism (favoritism for one's group at the expense of others) and altruism (willingness to risk one's life for it). These traits are quite similar to belligerence and bravery. In the earlier paper, it was also suggested that parochialism increases the chance of intergroup conflict, and the two traits increase the probability of winning in such conflicts. Personally, I am a bit skeptical of these theories of war, at least in the case of Greece. There may be something to them, but I don't think they explain the facts adequately. ...we see a fairly explicit expression of war as sacrifice for one's women and children. So, while a case can be made for war as a calculated risk which may enhance one's future breeding opportunities, a case can also be made for it as regular kin selection, where men sacrifice themselves for their existing kin. A second important point is the prevalence of the defensive war in the Greek tradition, which later became a part of the Western tradition. If war-like behavior and bravery had evolved in an offensive setting, then why was the need always felt to justify it in defensive terms, rather than as an opportunistic grab at the enemy's resources? A culture of shame more than belligerence or opportunism accounts for willingness to go to war. Wars may start as random fluctuations in inter-group relations, or as real conflicts for resources. But, people participate in them not so much because they envision opportunities for themselves, but because of the shame that the alternative would bring. Known cowards who do not join the ranks or abandon the field would suffer consequences much more terrifying as an incentive than the positive incentive of conquering an enemy's land. Finally, a special note must be made on "imperialistic" belligerence. We can assume that voluntary or coercive aggregation of tribes over the past led to an uneven distribution of the sizes of political entities. Whenever a large state found itself next to a small one, the temptation to conquer it would have been great, as such conquest would entail little risk. Large states could both gather the required human resources for war (because men with the right psychological profile or need could be found in its larger territory), and to wage such wars successfully. Tribal war occurs when a coalition of individuals use force to seize reproduction-enhancing resources, and it may have affected human evolution. Here, we develop a population-genetic model for the coevolution of costly male belligerence and bravery when war occurs between groups of individuals in a spatially subdivided population. Belligerence is assumed to increase an actor's group probability of trying to conquer another group. An actor's bravery is assumed to increase his group's ability to conquer an attacked group. We show that the selective pressure on these two traits can be substantial even in groups of large size, and that they may be driven by two independent reproduction-enhancing resources: additional mates for males and additional territory (or material resources) for females. This has consequences for our understanding of the evolution of intertribal interactions, as hunter-gatherer societies are well known to have frequently raided neighbouring groups from whom they appropriated territory, goods and women. As expected, the first principal component (PC 1) distinguishes Africans from non-Africans. The next three principal components also characterize continental regions: PC 2 distinguishes East Asians from Africans and Europeans, with South Asians and Mexicans at intermediate values; PC 3 distinguishes South Asians from East Asians; and PC 4 distinguishes Mexicans from non-Mexicans. The subsequent principal components mark within-continent variation. PC 5 reveals a north-to-south cline within Europeans (Figure 3), consistent with existing studies of European substructure. [...] PC 6 distinguishes the African Americans from the HapMap Africans. [...] Principal component 7 (Figure 2D) separates the three East Asian populations: Japan (left), HapMap CHB (center right), and Taiwan (far right). [...] We do not show further results because PC 8 and subsequent PCs display substructure within Africans and African Americans, but do not correspond to any known geographic or population structure among individuals. Matthew R. Nelson et al. Technological and scientific advances, stemming in large part from the Human Genome and HapMap projects, have made large-scale, genome-wide investigations feasible and cost effective. These advances have the potential to dramatically impact drug discovery and development by identifying genetic factors that contribute to variation in disease risk as well as drug pharmacokinetics, treatment efficacy, and adverse drug reactions. In spite of the technological advancements, successful application in biomedical research would be limited without access to suitable sample collections. To facilitate exploratory genetics research, we have assembled a DNA resource from a large number of subjects participating in multiple studies throughout the world. This growing resource was initially genotyped with a commercially available genome-wide 500,000 single-nucleotide polymorphism panel. This project includes nearly 6,000 subjects of African-American, East Asian, South Asian, Mexican, and European origin. Seven informative axes of variation identified via principal-component analysis (PCA) of these data confirm the overall integrity of the data and highlight important features of the genetic structure of diverse populations. The potential value of such extensively genotyped collections is illustrated by selection of genetically matched population controls in a genome-wide analysis of abacavir-associated hypersensitivity reaction. We find that matching based on country of origin, identity-by-state distance, and multidimensional PCA do similarly well to control the type I error rate. The genotype and demographic data from this reference sample are freely available through the NCBI database of Genotypes and Phenotypes (dbGaP). 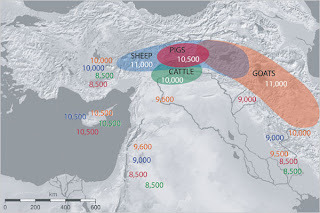 href="http://dienekes.blogspot.com/2008/02/huge-paper-on-human-genetic.html">two distinct "European" and "Caucasoid Central Asian" elements. Figure 3A shows summary plot of individual admixture proportions based on the highest-probability run of ten STRUCTURE runs. 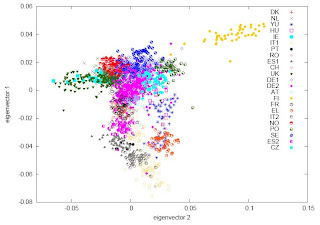 The results show that individuals from the same population often share membership coefficients in the inferred cluster, with the exception that one Japanese outlier shows obvious admixture. Mongola, Adygei, and Russian individuals show some degree of admixture as well. Most of the EAS admixture in the Adygei from the Caucasus seems mostly spurious, as the Adygei have a substantial "Central Asian" Caucasoid component (38%) rather than Mongoloid admixture (2%). Note that, as in the previous study, the Uyghur individuals seem to have similar proportions of "Western" and "Eastern" genes, due to the fact that the blend which produced them is fairly old and there are really no individuals in which either of the two components predominate. Following up on our previous study, we conducted a genome-wide analysis of admixture for two Uyghur population samples (HGDP-UG and PanAsia-UG), collected from the northern and southern regions of Xinjiang in China, respectively. Both HGDP-UG and PanAsia-UG showed a substantial admixture of East-Asian (EAS) and European (EUR) ancestries, with an empirical estimation of ancestry contribution of 53:47 (EAS:EUR) and 48:52 for HGDP-UG and PanAsia-UG, respectively. The effective admixture time under a model with a single pulse of admixture was estimated as 110 generations and 129 generations, or admixture events occurred about 2200 and 2580 years ago for HGDP-UG and PanAsia-UG, respectively, assuming an average of 20 yr per generation. Despite Uyghurs' earlier history compared to other admixture populations, admixture mapping, holds promise for this population, because of its large size and its mixture of ancestry from different continents. We screened multiple databases and identified a genome-wide single-nucleotide polymorphism panel that can distinguish EAS and EUR ancestry of chromosomal segments in Uyghurs. The panel contains 8150 ancestry-informative markers (AIMs) showing large frequency differences between EAS and EUR populations (FST > 0.25, mean FST = 0.43) but small frequency differences (7999 AIMs validated) within both populations (FST < 0.05, mean FST < 0.01). We evaluated the effectiveness of this admixture map for localizing disease genes in two Uyghur populations. To our knowledge, our map constitutes the first practical resource for admixture mapping in Uyghurs, and it will enable studies of diseases showing differences in genetic risk between EUR and EAS populations. This is a very important new paper, blogged about by Gene Expression and the Spittoon. DNA from many different individuals may be "mixed up", either literally (e.g. in a crime scene), or figuratively (in an allele frequency table where individual genotypes are averaged). If you have the genotype of a particular individual, can you tell whether or not he is included in the mix? The surprising answer is yes, even if the person contributes less than 1% to the mixture, provided that you study a large number of markers, such as the multi-100K chips by companies such as Illumina or Affymetrix. An individual's DNA shifts the sample's allele frequencies by very small amounts. 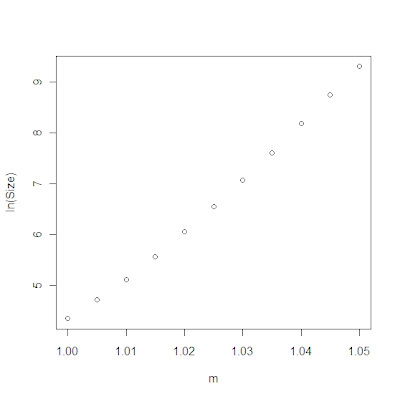 If the individual is included in the mix, then averaged over many loci, the sample will deviate from the overall population standard in the direction of the individual. Let's give a non-genetic analogy (I'm making these numbers up, but they'll do). If the Chinese height average is 1.75m, and a sample of Chinese has a height average of 1.8m, then Yao Ming is more likely to be in that sample. Of course, using one trait, it is impossible to conclude firmly that Yao Ming is in the sample: any number of tall Chinese could raise the sample average. But, averaged over many traits, Yao Ming's individual traits would stand out, whereas those of other tall Chinese men would not. The power of this technique relies on using a very large number of variables, which has become possible with the use of microarray chips measuring hundreds of thousands of polymorphisms. The forensic applications are clear: people's DNA gets mixed up all the time, yet investigators are interested in determining whether a particular individual (e.g. criminal or missing person) was present in a scene. The scientific implications are less clear, but more troubling. From now on, releasing a table of "allele frequencies" in a sample can't be guaranteed to mask the identities of individuals. Suppose someone asked you to participate in a scientific study, and you were told that no individual genetic information would be disclosed to the public, but only averaged information over all participants. You can no longer be content with that promise. Someone who has acquired your genotype can now figure out whether or not you participated in the study. In other words, the proposed solution would deprive the public of access to any type of genetic information produced by studies the public actually pays for. Instead, individuals' genotype data, it is proposed, will be shared among scientists themselves. Earlier post on this subject. Telamon was the father of the Aias (Ajax) of Telamon, the gigantic hero, who committed suicide in Troy, and Teukros who founded Salamis in Cyprus. The excavation must be performed urgently, as "from time to time there there are attempts at illegal excavation". Physical anthropologists will participate, who will examine whatever skeletal material is discovered. Liegen die wirklich spannenden Funde also unter dem spätmittelalterlichen Rungholt? Zumindest die überraschenderen. Es gab offenbar verschiedene Vorgängersiedlungen aus dem vierten oder dritten Jahrhundert vor Christus. Ein Fund hat uns nachgerade schockiert: Wir sind auf Überreste levantinischer und vor allem minoischer Transport- und Gebrauchskeramik aus dem Kreta des 13. und 14. Jahrhunderts vor Christus gestoßen. Darunter fanden sich auch Scherben zweier Drei-fußkochtöpfe. Das legt die Vermutung nahe, dass es bereits um 1400 vor Christus Schiffe gab, die von Kreta aus die nordfriesische Küste ansteuerten. Könnte es sich nicht um Antiquitäten handeln, die ein neuzeitliches Schiff an Bord hatte? Nein. Unsere Funde lagen unter einer bronzezeitlichen Torfschicht, die sich vermutlich schon 1200 vor Christus gebildet hat. Zwar wurden diese Moorböden bei der Besiedlung im Mittelalter vielerorts abgetragen - aber keineswegs dort, wo Warften, also Hauspodeste, aufgeworfen wurden. Und an genau einer solchen Stelle haben wir die antike Keramik entdeckt! Die Gefäße, die wir gefunden haben, waren auch höchstwahrscheinlich kein Handelsgut, das über Zwischenhändler nach Nordfriesland gelangt sein könnte. Die wertlose Gebrauchskeramik gehörte mit großer Sicherheit zu einer Schiffsausstattung. Was könnte die Minoer aus Kreta im 14. Jahrhundert vor Christus in die Nordseegelockt haben? Es war das Zinn aus Cornwall, wie anerkanntermaßen 1000 Jahre später zu Zeiten des Pytheas von Massalia. Das brauchten die Mittelmeervölker zur Herstellung von Bronze. Etwa 1700 vor Christus kam aufgrund kriegerischer Auseinandersetzungen im Orient immer weniger Zinn aus Afghanistan nach Kreta. Statt über Zwischenhändler suchten die Minoer offenbar den direkten Weg - und fanden ihn wohl auch. Und waren sie erst einmal auf der britischen Insel, dann war es auch nicht mehr allzu weit zum "Bernsteinland" an der nordfriesischen Küste, aus dem die Mykener den magischen "Sonnenstein", "die Tränen der Götter", bezogen. Bei seinen Ausgrabungen im Watt stießen Duerr und sein Team auf Spuren antiker Seeleute und Händler. In Kreta hergestellte Trink- und Essgefäße entrissen sie dem Schlick. Dazu eine Lanzenspitze, Weihrauch, Kopalharz und Lapislazuli. Den Fang krönte der erstmalige Fund eines minoischen Siegels außerhalb der Ägäis mit eingeritzten Zeichen der Linear-A-Schrift. Duerr gab die Artefakte zur Auswertung an Experten. Die Ergebnisse untermauern seine These. „Dass die Minoer in die Nordsee fuhren, ist sehr gut möglich – so schwer war das nicht“, bestätigt Walter Burkert, Doyen der Altphilologen von der Universität Zürich. In dieser natürlichen Einbettung sowie dem Umstand, dass neben wenigen Luxusgütern vor allem gewöhnliche Haushalts- und Transportgefäße zu Tage kamen, sieht Duerr „sichere Indizien, dass eine kretische Expedition vor etwa 3300 Jahren in die Nordsee gekommen sein muss“. Während Wertgegenstände durchaus von Hand zu Hand getauscht worden sein können, scheidet diese Möglichkeit für Nutzgeschirr aus – es lohnt die Mühen nicht. This study of sites of 84 temples of Classical (480-338 BC)Greece found no clear relationship of their sites with geological or topographical setting, or with compass orientation but there was a consistent correlation of soil type with particular deities (Figure 6). Temples to Athena and Zeus on soils of citadels (Anthrept) contrast with those of Artemis and Apollo on rocky soils (Orthent, Xerept) of wilderness. Hera and Hermes were worshipped on clayey soils (Xeralfs) suited to cattle grazing. Sanctuaries of Demeter and Dionysos are on fertile soils (Xerolls) suitable for mixed farming, whereas alluvial soils (Fluvents) of large farming estates were sacred to Hestia, Ares and Hephaestos. Temples of Aphrodite and Poseidon are on arid soils (Calcids) near fishing harbours, but caves were sacred to Persephone and Hades. The author suggests that this pattern is explained by the coming together of tribes with different economic activities. This is a very interesting paper to read, not least for the beautiful illustrations which accompany it. This study explores bedrock geology, topographic setting, compass orientation, soil profile and plant cover at 84 temples of Classical (480-338 BC) mainland Greece, several Aegean islands and Cyprus. A striking pattern emerges: the soil and vegetation matches the dedications to particular deities, suggesting an economic basis for particular cults. Not at all easy, and quite arbitrary. For example, China and Egypt are assigned the longest durations, whereas Mycenaeans and Greeks are divided, even though the Mycenaeans spoke Greek, and Roman civilization, at least in the eastern provinces was never anything other than Greek. It could be argued that foreign political dominance would render Roman-era Greek civilization as non-Greek, but then it should render large periods of Egyptian and Chinese civilization non-Egyptian and non-Chinese as well. And, what of the decision to use Corinth's co-ordinates for Greek civilization, since none of the important elements of post-Mycenaean Greek civilization originated in Corinth. Without a clear rule about what constitutes a civilization, when/where it begins and when it ends, this is just a futile exercise. There may be something to earthquakes and civilization, since earthquakes may facilitate change and adaptation, but this is certainly not the way to demonstrate it. The map distribution of ancient civilizations shows a remarkable correspondence with tectonic boundaries related to the southern margin of the Eurasian plate. Quantification of this observation shows that the association is indeed significant, and both historical records and archaeoseismological work show that these civilizations commonly suffered earthquake damage. Close association of ancient civilizations with tectonic activity seems to be a pattern of some kind. In the hope that dividing the civilizations into subsets might clarify the meaning of this relation, primary and derivative civilizations were compared. Derivative civilizations prove to be far more closely related to the tectonic boundaries. Similarly, the civilizations that endured the longest (and that have been described as most static) are systematically the farthest from plate boundaries. It is still unclear how the relation actually worked in ancient cultures, i.e., what aspects of tectonism promoted complexity. Linkages to water and other resources, trade (broadly construed), and societal response seem likely. Volcanism appears not to be involved. Abstract This study documents long-term changes in stature from the Mesolithic to the late 20th century in the territory of modern Portugal. Data utilised originated from published sources and from a sample of the Lisbon identified skeletal collection, where long bone lengths were collected. Mean long bone lengths were obtained from 20 population samples and compiled into nine periods. Pooled long bone lengths for each period were then converted to stature estimates. Results show three major trends: (1) a slow increase in stature from prehistory to the Middle Ages; (2) a negative trend from the Middle Ages to the late 19th century; and (3) a very rapid increase in mean stature during the second half of the 20th century. The political and territorial stability of the Kingdom of Portugal may have contributed to the greater heights of the medieval Portuguese, compared with the Roman and Modern periods. The negative secular trend was rooted in poor and unsanitary living conditions and the spread of infectious disease, brought about by increased population growth and urbanisation. Although the end of the Middle Ages coincided with the age of discoveries, the population may not have benefited from the overall prosperity of this period. The 20th century witnessed minor and slow changes in the health status of the Portuguese, but it was not until major improvements in social and economic conditions that were initiated in the 1960s, and further progress in the 1970s, that the Portuguese grew taller than ever before. Since the Middle Ages other European countries have experienced similar oscillations, but showed an earlier recovery in stature after the industrial period. Kobyliansky E, Balueva T, Veselovskaya E, Arensburg B. The present report deals with reconstructing the facial shapes of ancient inhabitants of Israel based on their cranial remains. The skulls of a male from the Hellenistic period and a female from the Roman period have been reconstructed. They were restored using the most recently developed programs in anthropological facial reconstruction, especially that of the Institute of Ethnology and Anthropology of the Russian Academy of Sciences (Balueva & Veselovskaya 2004). The basic craniometrical measurements of the two skulls were measured according to Martin & Saller (1957) and compared to the data from three ancient populations of Israel described by Arensburg et al. (1980): that of the Hellenistic period dating from 332 to 37 B.C., that of the Roman period, from 37 B.C. to 324 C.E., and that of the Byzantine period that continued until the Arab conquest in 640 C.E. Most of this osteological material was excavated in the Jordan River and the Dead Sea areas. A sample from the XVIIth century Jews from Prague (Matiegka 1926) was also used for osteometrical comparisons. The present study will characterize not only the osteological morphology of the material, but also the facial appearance of ancient inhabitants of Israel. From an anthropometric point of view, the two skulls studied here definitely belong to the same sample from the Hellenistic, Roman, and Byzantine populations of Israel as well as from Jews from Prague. Based on its facial reconstruction, the male skull may belong to the large Mediterranean group that inhabited this area from historic to modern times. The female skull also exhibits all the Mediterranean features but, in addition, probably some equatorial (African) mixture manifested by the shape of the reconstructed nose and the facial prognatism. ASPM was initially identified in human-chimp comparisons. Since it was expressed in the brain, it was thought that it played a role in making us different from our closest relatives. This new paper shows that adaptive evolution of ASPM is not limited in the human-chimp split, but occurred in many different primate lineages. Moreover, the target of its evolution was the cerebral cortex. Note that these results are not directly applicable to the recently selected variant within the human lineage (some recent discussion). The rapid increase of brain size is a key event in human evolution. ASPM (abnormal spindle-like microcephaly associated) is discussed as a major candidate gene for explaining the exceptionally large brain in humans but ASPM’s role remains controversial. Here we use codon-specific models and a comparative approach to test this candidate gene that was initially identified in Homo-chimp comparisons. We demonstrate that accelerated evolution of ASPM ( = 4.7) at 16 amino acid sites occurred in nine primate lineages with major changes in relative cerebral cortex size. However, ASPM’s evolution is not correlated with major changes in relative whole brain or cerebellum sizes. Our results suggest that a single candidate gene such as ASPM can influence a specific component of the brain across large clades through changes in a few amino acid sites. We furthermore illustrate the power of using continuous phenotypic variability across primates to rigorously test candidate genes that have been implicated in the evolution of key human traits. This seems to be consistent with my theory of hair as a frame. As facial features deteriorate with age (30), the absence-of-frame effect favors blondes at the expense of brunettes. At the even higher age (40) attractiveness overall declines and the absence-of-frame trick is no longer effective. Percept Mot Skills. 2008 Jun;106(3):737-44. Attractiveness of blonde women in evolutionary perspective: studies with two Polish samples. An experimental study was undertaken to assess the phenomenon of male preference for blondes. In the first study, 360 Polish men ages 18 to 46 years were asked to assess the attractiveness of the presented stimuli using a 9-point scale. Stimuli were 9 different pictures of the same women whose ages (about 20, 30, and 40 years old) and hair colors (blonde, brown, and brunette) were manipulated. Pictures of blonde-haired women were generally rated as younger than the others. The attractiveness ratings of female faces changed with age and hair color. Still, only the 30-yr.-old woman with blonde hair was rated as significantly more attractive than those with brown or brunette hair. In a second study (the analysis of 500 Internet advertisements) mature women dyed their hair blonde more frequently. These results are analyzed with regard to the evolutionarily formed male preference for younger females. No matter how hard men try, they may not be able to hide their aggression. A study in male ice-hockey players suggests that to gauge a man's aggression levels, you just have to look at the proportions of his face. Cheryl McCormick and Justin Carre from Brock University in Ontario, Canada, found that the larger the width-to-height ratio of a player’s face, the more aggressive they were. They measured aggression by the number of penalty points each player accrued for potentially harmful behaviour, such as elbowing and fighting. In general, men's faces tend to have a larger width-to-height ratio than women's. This physical characteristic has been linked to higher levels of testosterone, which in turn is linked to aggressive behaviour. Facial Morphology in Various Ethnic Groups/Races], it appears that this is not the case. Out of the 25 groups where both male and female data exist, in 19 men have a higher facial index (narrower-faced) than women, and in 6 the opposite is true. The median ratio of men/female F.I. is 101.9% (Slovenians); for Greeks it is 102%, very close to the median. For white Americans, the ratio is 102.3%. I also looked at Howells' craniometric data, which includes a wider sampling of world populations, taking the ratio of Nasion-Prosthion/Bizygomatic. The ratio of the male to the female average is 99.5%, practically the same. So, while men do have wider faces in the absolute sense (mean +7.6%, median +3.6% in the Howells set; mean +5.6%, median +6.3% in the Farkas set), they do not appear to have wider faces in terms of proportions compared to women. I have posted the abstract below. They looked at the upper face, not the total face height, thus the data of Farkas et al. (which did not measure upper face height) are not relevant. But, the skull data of Howells is relevant, and do show the predicted sexual dimorphism, although not very noticeable on a global scale. The authors cite Weston et al. (2007). They used a South African collection to arrive at this conclusion. So, these don't look supportive of greater ZYB/NPH in males than in females. In this paper, the authors measured ZYB/NPH from photographs. It is very difficult to get an accurate estimate of the nasion, prosthion or zygomata using a photograph; the authors report high inter-rater reliability, but reliability means that different raters measure similarly, not that they measure correctly! In particular they measured upper facial height from the brow to the lip. Their photograph indicates that they took this measurement from the lower point of the eyebrows. Since men are both hairier and don't remove eyebrow hair, it is quite possible that women's upper facial height was inflated. In any case, taking the upper facial height from the brow is not consistent with taking the nasion-prosthion height. So, while the conclusion that broader-faced men are more aggressive is correct, the explanation that it is due to men having a higher breadth/upper face ratio seems suspect. Sadly, this group seems to be stuck in the prehistoric age of Y-SNP testing, essentially using the same coarse group of markers that they used half a decade ago. Nonetheless, an addition to the sampling of the world's genetic diversity. No mtDNA haplogroup frequency is included. The most noticeable features of the Y-chromosomes of the Talysh are the predominance of haplogroups J2 (23-32%) and R1*(xR1a1) (14-48%), and the paucity of haplogroup R1a1 (2-3%), considered by some as an Indo-Iranian marker. Also noticeable is the presence of 16% K*(xP) in the Southern Talysh, but 0% in the Northern ones. Some Y-STRs were typed, but no haplotypes were included, or measures of STR variance; only some network diagrams. The Northern Talysh from Azerbaijan and the Southern Talysh from Iran self-identify as one ethnic group and speak a Northwestern Iranian language. However, the Northern and Southern Talysh dialects are so different that they may actually be separate languages. Does this linguistic differentiation reflect internal change due to isolation, or could contact-induced change have played a role? We analyzed mtDNA HVI sequences, 11 Y-chromosome bi-allelic markers, and 9 Y-STR loci in Northern and Southern Talysh and compared them with their neighboring groups. The mtDNA data show a close relatedness of both groups with each other and with neighboring groups, whereas the Northern Talysh Y-chromosome variation differs from that of neighboring groups, probably as a result of genetic drift. This genetic drift most likely reflects a founder event in the male gene pool of Northern Talysh: either fewer males than females migrated to Azerbaijan, or there was a higher degree of relatedness among the male migrants. Since we find no evidence of substantial genetic contact between either Northern or Southern Talysh and neighboring groups, we conclude that internal change, rather than contact-induced change, most likely explains the linguistic differentiation between Northern and Southern Talysh. Zane and his co-investigator, UC Davis psychology graduate student Lauren Berger, found that 34 percent of biracial individuals in a national survey had been diagnosed with a psychological disorder, such as anxiety, depression or substance abuse, versus 17 percent of monoracial individuals. I don't know what accounts for this phenomenon, but it's strange that a biological or genetic cause is not listed as a possibility. From an analysis of the skeletons and pottery in those two seasons, scientists identified the two successive cultures that occupied the settlement. The Kiffians, some of whom stood up to six feet tall, both men and women, lived there during the Sahara’s wettest period, between 10,000 and 8,000 years ago. They were primarily hunter-gatherers who speared huge lake perch with harpoons. Christopher M. Stojanowski, an archaeologist at Arizona State University, said the two cultures were “biologically distinct groups.” The bones and teeth showed that in contrast to the robust Kiffians, the Tenerians were typically short and lean and apparently led less rigorous lives. Perhaps, Dr. Stojanowski said, they had developed more advanced hunting technologies for taking smaller fish and game. Paul C. Sereno et al. Approximately two hundred human burials were discovered on the edge of a paleolake in Niger that provide a uniquely preserved record of human occupation in the Sahara during the Holocene (~8000 B.C.E. to the present). Called Gobero, this suite of closely spaced sites chronicles the rapid pace of biosocial change in the southern Sahara in response to severe climatic fluctuation. Two main occupational phases are identified that correspond with humid intervals in the early and mid-Holocene, based on 78 direct AMS radiocarbon dates on human remains, fauna and artifacts, as well as 9 OSL dates on paleodune sand. The older occupants have craniofacial dimensions that demonstrate similarities with mid-Holocene occupants of the southern Sahara and Late Pleistocene to early Holocene inhabitants of the Maghreb. Their hyperflexed burials compose the earliest cemetery in the Sahara dating to ~7500 B.C.E. These early occupants abandon the area under arid conditions and, when humid conditions return ~4600 B.C.E., are replaced by a more gracile people with elaborated grave goods including animal bone and ivory ornaments. The early Holocene occupants at Gobero (7700–6200 B.C.E.) were largely sedentary hunter-fisher-gatherers with lakeside funerary sites that include the earliest recorded cemetery in the Sahara. Principal components analysis of craniometric variables closely allies the early Holocene occupants at Gobero with a skeletally robust, trans-Saharan assemblage of Late Pleistocene to mid-Holocene human populations from the Maghreb and southern Sahara. Gobero was abandoned during a period of severe aridification possibly as long as one millennium (6200–5200 B.C.E). More gracile humans arrived in the mid-Holocene (5200–2500 B.C.E.) employing a diversified subsistence economy based on clams, fish, and savanna vertebrates as well as some cattle husbandry. Population replacement after a harsh arid hiatus is the most likely explanation for the occupational sequence at Gobero. We are just beginning to understand the anatomical and cultural diversity that existed within the Sahara during the Holocene. Even earlier, during the Geometric Periods, there is some evidence to suggest that embalming was not unknown; it has long been recognised that the means by which the bodies of Homeric figures (Achilles, Sarpedon and Hektor) were preserved until their final disposal were, in fact, reminiscent of the art of the Egyptian embalmers (Garland, 2001). Another example is Alexander the Great (356 BC – 323 BC), whose was reported to be preserved in beeswax (Kurtz and Boardman, 1971; Aufderheide, 2003). The same applies for the Roman Period, where, although embalming was looked upon as a foreign custom and was, on the whole, not extensively practised, mummies embalmed according to the ancient Egyptian customs were sporadically discovered both in Italy and the provinces, e.g. the Empress Poppaea Sabina (30-65 AD) (Toynbee, 1971) and the mummy of Grottarossa (Ascenzi et al., 1996; Toynbee, 1971). The current colour of the hair is brown with reddish highlights, a common observation on many mummies, and probably originated through post-mortem alteration (Aufderheide, 2003; Wilson et al., 2001). Sun-exposure, bacterial reaction, and embalming methods are some of the factors that may affect the original hair colour. As a result, hair that was originally black or brown exhibits reddish, orange or even blond colour due to post mortem alterations. 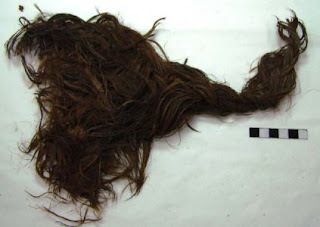 All human hair, however, does not turn red over archaeological time-scales (Wilson, 2001). Based on the histological analysis of the unstained hair samples, the limited fungal influence, and the macroscopic view, it can be assumed that the original hair colour was brown. Similar cases of hair preservation have been reported in studies of both mummified and non-mummified human remains (Aufderheide, 2003; Brothwell and Dobney, 1986; Lubec et al., 1987; White, 1993; Wilson et al., 2002, 2007b). triterpenoids, and diterpenoids, originating from coniferous and pistacia resins, myrrh, and other spices, verify ancient information on preparation methods of the dead in Greek and Roman times. These chemical components are thought to have played a prominent role in the mummification mechanism in this particular case. The potential effect of the lead coffin in the mummification process was also examined. Energydispersive X-ray analysis failed to detect lead penetration into the tissues, suggesting that the coffin played a limited role in the preservation of soft tissue. Here is the home page of Melinda Zeder, including a page on Animal domestication in the Near East with several older online papers. was thought to have been colonized ca. (sheep, goat, cattle, and pig). period of population decline and relocation. by the wave and advance model. !! VERY IMPORTANT NOTE !! : If you downloaded it before August 13, please download again, since an important bug fix has been incorporated in the code. These do not affect the results I posted recently, since these were obtained by a sound version of the code. NEW UPDATE (Sep 18): the YMGS has been updated (see related erratum). You can download C++ code for the types of simulations on Y-STRs that I did recently. Feel free to report any bugs, comments, problems, observations, ... at my e-mail address (right sidebar). This is part III in the trilogy on dating Y-chromosome Most Recent Common Ancestors (Y-MRCAs) using microsatellite variation. See part I and part II. xi is the observed allele in one of the n descendants of the unknown Y-MRCA. The ancestral allele, xa, is generally unknown, and can be estimated e.g. by taking the modal (most frequent) or median allele from the xi's. The parameters wa and wv are effective mutation rates, and they govern how sharply ASD or Variance accumulates with the passage of time (g). While Zhivotovsky, Underhill and Feldman (2006) (Z.U.F.) studied wv using many simulations with many different population histories, and Zhivotovsky et al. (2004) (pdf) derived wa from "known" real-life histories (of Bulgarian Gypsies and Maori), the proposed effective rate of 0.00069/locus/generation (which is 3.6x lower than the observed germline rate) has been used indiscriminately in the literature for all kinds of populations and all kinds of statistics (both ASD, and Variance, and even ρ as in the recent paper on African pastoralists). But, if you read Zhivotovsky, Underhill and Feldman (2006) or my two previous posts on the subject, you will realize that the effective rate depends on population history; that the 0.00069 rate is derived for constant-sized populations where haplogroups never grow to large numbers; that most interesting haplogroups that scientists date with it are so large that can't have grown under the assumptions leading to the 0.00069 rate; hence, there has been a general overestimation of Y-MRCA ages whenever the one-size-fits-all rate is used. What is an appropriate effective mutation rate? I have previously hinted that the appropriate effective mutation rate is much closer to the germline rate μ, i.e. the probability that a son's allele differs by 1 repeat from that of his father. 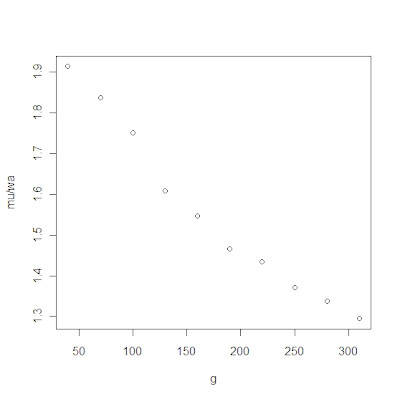 Now, I present some more systematic simulations which address the issue of the rate for (i) different population growth m (=average number of sons/man according to a Poisson process) and (ii) different antiquity in generations g. As usual, I keep μ=0.0025 and average results over 10,000 simulation runs. The following table lists g, m, Size, Var, ASD, μ/wv, μ/wa. The average number of descendants is Size. 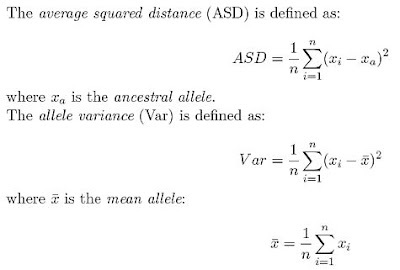 I calculate ASD using the median allele from the observed ones. 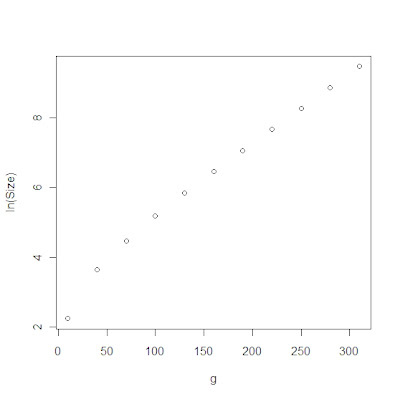 As you can see, the correction factor μ/wv=3.6 is at the upper limit of these rates. For a constant-sized population (m=1), μ/wv approaches 3.6 with increasing g. But, for all (g, m) settings resulting in a fairly large haplogroup (but still smaller than observed ones), the correction factor for both ASD and Variance is less than 1.3. Suppose that a haplogroup has Size=1,000,000 men, and an ASD=0.275. Using the Z.U.F. rate leads to a TMRCA estimate of 0.275/0.00069 = 399 generations. 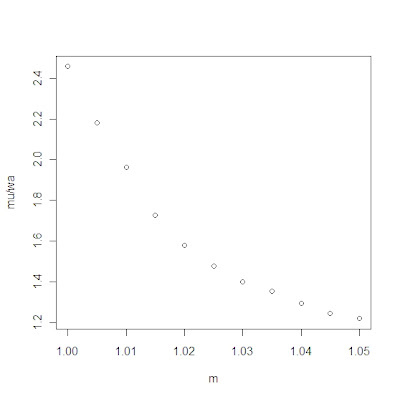 Yet, for 400 generations, even if m=1, the observed ASD is 0.37 but the Size=207. If the haplogroup did originate 400 generations ago, it should have grown at a faster rate than 1.02/generation to reach its current size; but this would have led to an ASD greater than 0.821 (last row of the table). So, the estimate of 399 generations using the Z.U.F. rate is a gross overestimate.